There are many different objectives that governments might pursue by way of intervention in private markets. These objectives fall under a few broad categories that characterize many of the efforts at government regulation. The following are some of the more commonly observed regulatory objectives. Among the most common set of objectives for government regulatory policy is the maximization of social welfare through the remediation of various types of market failure. For example, agents can gain market power through the creation of monopolies, cartels, or other forms of organization that limit the benefits from competitive markets and trade. Natural monopolies are one such type of market failure that has been prevalent throughout the historical development of transportation networks, often due to the high fixed costs of developing infrastructure. Externalities are another common type of market failure that can justify regulatory intervention. Regulatory efforts toward externalities often focus on negative externalities. For example, in the context of transportation many modes experience congestion where prices as a means of rationing capacity are absent. Likewise, the consumption of energy often leads to emission of pollutants which, when unpriced, can lead to undesirable outcomes. Positive types of externalities are also possible and can in some situations justify government intervention. For example, in systems where Network effects are present, government may be able to increase social welfare by speeding up the growth of the network so that it serves a large number of users. Other types of market failure justifications for intervention involve the provision of certain public goods (a classic example being national defense) and the remediation of some types of information asymmetry. A second set of objectives that are pursued primarily by national governments revolve around macroeconomic performance. Macroeconomic objectives include efforts to control inflation, for example through the adoption of monetary policy. They also include efforts to counteract the effects of economic cycles, for example by adopting policies to maintain employment during periods of recession. Some governments may also seek to actively control their country's balance of payments through the use of policies aimed at promoting or discouraging exports or imports (e.g. through tariffs and subsidies). Government may also intervene in order to promote a range of socio-economic objectives. Many of these objectives may be motivated by concerns over fairness, such as efforts to achieve a desired income distribution, or a desire to provide a basic standard of service to all citizens, such as programs that offer mobility to people with mental or physical disabilities. Other interventions may be designed to promote safety where it is thought that market participants are unable to account for certain types of risk. An example of this in the United States is the Consumer Product Safety Commission (CPSC), an agency that has the authority to regulate the sale and manufacture of thousands of consumer products. Still other socio-economic objectives may include things like industrial policy, where governments intervene to promote certain sectors of the economy, or even to promote individual industries or firms. Apart from the three categories of objectives for intervention listed above, governments may intervene for other reasons broadly related to national interests. Some interventions are undertaken to promote national unity, such as the construction of the Transcontinental Railroad in the US during the Civil War. The provision of national defense which, as noted above is an important type of public good, is almost universally seen as grounds for government intervention. Finally, some interventions are undertaken in order to promote national prestige. Efforts in many world cities and their respective countries to attract the summer or winter Olympic Games, which may often involve the development of expensive new infrastructure projects, might fall into this category. Governments have many different instruments of intervention at their disposal in order to pursue the types of objectives outlined in the previous section. These may range in scope from simple instruments such as exhortation and information provision to actual ownership and operation of enterprises in certain industries. Regulation is among these instruments and will be introduced in the context of some of the more common instruments of intervention. Here, government attempts to affect user choice through propaganda. Governments and politicians may influence policy outcomes in ways that involve little or no direct expenditure or regulatory action. The provision of information by itself may sometimes be enough to influence desired outcomes. Public speeches and exhortation may sometimes be used as a way to influence support for a particular policy. For example, the US Vice President Joe Biden, a former senator from the state of Delaware, frequently commutes to Washington, D.C. by rail on Amtrak, the national passenger rail service. He often uses public speaking engagements to tout the benefits of Amtrak and to encourage support, both through actual patronage of the system and through support for additional public spending. The use of exhortation to influence policy outcomes is one example of a set of policy instruments collectively referred to as moral suasion. Moral suasion strategies may rely on a variety of mechanisms in order to enhance policy success, but they tend to have common elements of the use of persuasion (such as appealing to moral authority or community spirit), as opposed to outright coercion, in order to achieve desired outcomes. Several prominent examples of the use moral suasion appeared in the US during World War II. The US government used several types of propaganda appealing to citizens' sense of patriotism in order to mobilize resources for the war effort. Posters were issued by the government and distributed throughout the country to promote programs such as the planting of victory gardens and investment in war bonds. 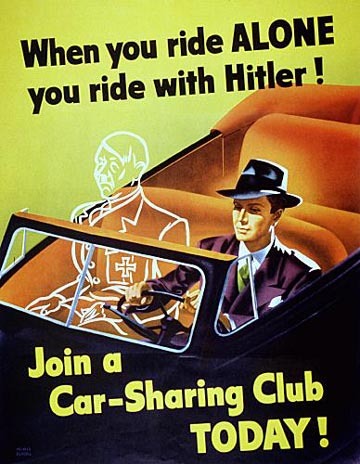 The propaganda poster to the right, promoted the conservation of energy through voluntary carpooling (referred to in the poster as "car-sharing") during WWII, appealing to citizens with the phrase "When you ride alone, you ride with Hitler!". Recent successful efforts to promote recycling and discourage smoking include large elements of moral suasion. One of the more common methods of government intervention is to provide direct expenditures in order to ensure the production of goods considered socially beneficial. Government expenditures may be justified on the grounds that they promote the provision of public goods or quasi-private goods that have some public good aspects, such as education. Grants and subsidies may be used to encourage the production of a good by public or private sector. Often these instruments are combined with the direct public provision of facilities. For example, the US federal government makes grants to state and local governments for the provision of highway and public transit networks, payed for largely with revenues from the Highway Trust Fund. In most cases, the recipients of these funds are public entities that build and maintain these networks. A common rationale for the public provision of these networks is that they display characteristics of natural monopolies. Governments may also reserve the right to regulate certain activities for economic, social or other purposes. In the transportation sector, for example, many industries have market structures that inherently limit entry and can lead to concentration or monopoly (e.g. railroads, airlines). Rather than provide these services directly, many governments have chosen instead to maintain private provision, subject to some form of regulation. Some examples of these will be provided in the next section. In the US, the power to regulate transportation derives mostly from the Commerce Clause of the US Constitution. There are many instruments that governments may use in order to implement and enforce regulation. Most government regulatory bodies promulgate rules or guidelines in order to set standards of firm behavior in a regulated industry. Fines and penalties may be used as tools of compliance in order to punish violations of established rules. In the context of international trade, where sovereign nations may have no formal legal powers over their trading partners, taxes and tariffs may be used in order to influence trade activities. These instruments may also be used by voluntary associations that govern trade activities, such as the European Union and the World Trade Organization. Where other forms of regulation are deemed infeasible for dealing with potential market failure problems, governments may simply choose to directly provide a good or service through a public agency or state-owned enterprise (sometimes referred to as a crown corporation). The use of public ownership may allow governments to set more efficient prices in cases where production is subject to strong scale economies, or where regulation of an activity through conventional means is particularly difficult. Government provision of a good may rely on direct ownership and operation, or may involve some form of private involvement, perhaps through a lease arrangement with the public owner. This type of arrangement will be discussed further in the chapter on ownership. Economic regulation is an attempt by government to deliberately alter the allocation of resources and distribution of incomes away from that which would have occurred in the absence of such regulation. It is thus a means by which government can attempt to substitute its judgement of what constitutes a 'proper' allocation of resources and distribution of income for the outcome yielded by the market. Transportation had been a heavily regulated industry in the US until recently. There are two major opposing theories on why economic regulations exist, consumer protection and industry protection, which are discussed below. Some other rationales for regulation are also described which don't fit neatly into these two categories. The traditional and ideal view is that regulation is a device for protecting the public against the adverse effects of monopoly. This view, as described by Posner, is commonly referred to as the public interest theory of regulation. Nominally, the main objective is to maximize social welfare by correcting market failure, which may occur in several forms. For example, governments may choose to regulate monopolies in order to force them to produce the level of output that maximizes social welfare. Monopolies may arise for a couple of reasons. In some cases, an industry might be inherently "monopolistic" due to the existence of economies of scale, limited markets, or requirements for high levels of initial investment, which may deter entrants. In other cases, industries may exhibit high fixed costs (indvisibilities), common and/or joint costs, which make them prone to monopoly. Another consumer protection rationale for the provision of regulation is the need to correct for externalities. Where negative externalities like pollution are present and serious enough to merit intervention, governments may intervene to correct these externalities by regulating the quantity of pollution emitted, or by setting higher prices to induce less production/consumption of the externality. The contrasting and more recent view, that of regulatory capture, is that regulation is procured by politically effective groups (assumed to be composed of the members of the regulated industry itself), for their own protection. The reasoning behind this view is that industry attempts to acquire regulation mainly because regulation will help them generate economic rents. Furthermore, producers in an industry are more likely to have an incentive to influence regulatory activities, given their greater financial interest relative to individual consumers. Thus, producers are far more effective in pressuring government than are general interest consumer groups. Stigler argues that producers essentially "capture" regulatory agencies, stating that "as a rule, regulation is acquired by the industry and is designed and operated for the industry and not for the "public interest" (p. 3). Therefore, regulatory commissions end up "protecting" industry from consumers, conferring benefits on producers that they would not be able to obtain in more competitive markets. Stigler's ideas were formalized in a later paper by Peltzman. Similar arguments have been used by political scientists to describe the relationship between Congress, federal agencies, and interest groups, often under the term iron triangle. In this case, the relationship is tripartite, disaggregating the role of government into objectives pursued by elected officials and those pursued by agencies responsible for administration and oversight of federal programs. This framework has been used to analyze the behavior of certain federal agencies, such as the Tennessee Valley Authority, as well as to describe the dynamics of industry-government relationships in the Military-industrial complex. An interesting variation on the regulatory capture framework, commonly referred to as Bootleggers and Baptists, has been applied to describe situations in which incumbent firms demand greater regulation, often with lobbying support from groups with conventionally opposing positions . The namesake application of the theory describes the phenomenon, frequently observed in southern states, of alcohol sales being banned on Sundays. The ban is supported primarily by Baptists and other groups that seek to limit the consumption of alcohol, ostensibly for moral reasons. The ban also enjoys tacit support from illegal suppliers of alcohol (the "bootleggers"), who benefit from the prohibition in the form of greater market power in the provision of alcoholic beverages on Sundays. Outside of this traditional application, the framework has been applied to other areas of regulatory policy, such as certain aspects of environmental regulation. The framework describes regulators' preference for certain technology-specific mandates (e.g. "scrubbers" for power plant smokestacks in the 1977 Clean Air Act) as a means of reducing pollution. In this case, environmentalists demanding greater regulation to ensure better air quality serve as the Baptists, while the equipment suppliers who manufacture the scrubbers serve as the bootleggers and lobby for specific provisions requiring the use of scrubbers. A common feature of firm behavior in this framework is the use of regulation to obtain market power, often through entry restrictions. In the clean air example, plants that must comply with the regulation often have incentive to support it after it has been implemented. Compliance in this case involves one-off expenditures on the procurement of the pollution control equipment. The equipment might be expensive, but becomes a sunk cost after implementation. The requirements for this expensive, new equipment become a barrier to entry for prospective firms looking to enter the market. The incumbent firms also tend to operate at higher levels of output, thus enabling them to spread the costs of the pollution control equipment across a greater number of consumers, lowering average costs. Economic regulation has also historically been employed in some cases where a government sought to promote the growth of an infant industry. The infant industry argument for regulation is typically invoked in cases where a nation sees the existence of potentially large external benefits from the growth of an industry, or the potential for other important non-economic benefits. A classical example of the promotion of an infant industry is the US federal government's promotion of the growth of air travel on the grounds that it would provide a faster, cheaper and more effective means of delivering air mail. While air mail was initially provided by the US government between 1911 and 1918, the 1926 Kelly Act contained provisions that required the US Post Office Department to contract with commercial air carriers for the delivery of air mail on intercity routes. These contracts were an important source of revenue for the nascent airline industry. The mail contracts may be considered a form of implicit subsidy to the early airline industry. In addition to subsidization, other instruments that may be used by government to promote infant industries include regulations on entry (entry barriers) or regulations mandating the supply of a specific quantity of a good. predatory pricing, where firms set artificially low prices in order to deter competition from potential market entrants, or to drive existing competitors out of business. When dealing with instability in supply prices in certain industries, as for example with electric power, regulation is used to smooth output prices. In other cases, as with road networks, the infrastructure tends more often to be publicly owned. In the case of road networks, especially in urban areas, congestion can create instability in supply prices, since the "supply" function for a road link is a function of traffic volumes. To achieve efficiency in this case, governments (or even private owners) can set prices equal to marginal cost in order to eliminate the congestion externality and smooth output prices. Uneconomic rate levels can arise (at least in the short run) through anti-competitive practices, though in practice it has more commonly been the result of regulatory rate-setting practices that have been ameliorated through regulatory reforms. For example, many streetcar and subway networks in the US were formerly privately owned, though as participants in local franchise agreements with local governments they were subject to several forms of regulation, including price regulation. Limits on the rail operators' ability to increase revenues through fare increases, which were politically unpopular, were a contributing factor toward the decline of many urban rail systems. The inability to raise revenues through fares frequently led to deferred maintenance of the capital stock of these systems, which in turn led to declining service quality and lower ridership, an example of a vicious circle. Predatory pricing is most common in markets characterized by few firms, intense competition and low profit margins. Deregulated local bus services in many British cities have seen instances of predatory behavior, such as the Darlington Bus War which took place in the English town of Darlington following the deregulation of local bus service in the mid-1980s. The fact that local bus services in many British cities continue to be supplied by a single, incumbent firm in spite of some limited competition from new market entrants has led some observers to suggest that urban bus services may be natural monopolies. Immature pricing behavior has been observed to some extent in the deregulated US airline industry. The entry of new carriers on an airline route, in addition to multimarket contact between carriers, frequently leads to price wars. Price wars may dampen carrier profits and increase their volatility, but they also confer significant benefits on consumers. Some industries with high fixed costs may adopt uneconomic pricing levels, at least in the short run, in situations where there is significant excess capacity (perhaps due to recession) and the process for adjusting capacity is slow or difficult. In this case, firms may price output to cover variable costs, but not average total costs. Private toll roads, especially those built at the fringe of developing urban areas, tend to have traffic levels that are sensitive to economic growth rates. Recessions can cause declines in demand that sharply lower revenues. Owners may respond by lowering toll rates to encourage traffic, since in this case significant excess capacity may exist. The revised toll rates may cover the variable costs of operating and maintaining the road, but may not contribute to recovering its fixed costs. Airlines may be vulnerable to similar types of conditions. Demand for air travel is known to be income-elastic and airlines must often place orders for new aircraft several years in advance. This combination of volatile demand and slow supply-side adjustment often leads to excess capacity during recessions. Airlines tend to respond by lowering fares in order to fill available capacity, even if the fares fall below average total cost. Regulators may also establish safety standards, which are not discussed here. Price regulation involves the setting of limits (maximum or minimum) on the prices firms may charge for their product. In cases where prices are regulated to limit the potential abuses of monopoly suppliers, regulators may impose price-cap regulations or alternatively revenue-cap regulations. Price-cap regulations typically limit price increases to changes in economy-wide price indices (such as the consumer price index). This approach has the advantage of controlling unreasonable price increases, while retaining incentives for producers to increase profits by reducing their costs. Price regulations may also be employed to set minimum rates in cases where cut-throat competition drives prices below marginal costs for extended periods of time. Minimum rate regulations, for example, could prevent the exercise of predatory pricing in industries with few competitors. Prior to deregulation, carriers applied to regulators for any rate change; the regulatory agency could approve, deny or vary the changes. However, generally no inflation adjustments were built into rates, and the burden was on the carrier to prove need for changes. Unjust and unreasonable rates were not allowed; e.g. youth fares could be judged as justly high, while monopoly or predatory prices could be judged as being unreasonably high or low. Since deregulation, carriers simply file proposed fare changes, and make fares available for customers to look at. Regulator can disapprove or vary changes in 'basic fare level' upon complaints, but this rarely happens. Under rate-of-return regulation, regulatory authorities explicitly or implicitly use rate-based regulation for the carrier when they examine proposals for fare change. If the carrier made more than fair returns, fare change proposal may not get approved. Regulation of entry and exit was commonplace prior to deregulation. Entry both into the industry, and onto specific routes was regulated (as was exit). Prior to deregulation, entry of a new firm into the industry required a certificate of Public Convenience and Necessity (PCN), where burden of proof (of need for new services) was on applicant. After deregulation, new entrants needed to demonstrate they are "Fit, Willing and Able", and no longer need to show need for new service. Nevertheless, the common carrier obligation remains, and new carriers must serve all requests from public. Entry onto routes prior to deregulation was also quite cumbersome. A route license was required for airlines and truckers. That license may have restricted carriers to certain commodities or classes of service. Since deregulation, entry onto routes was much more open. Exit was also regulated. Prior to deregulation, it was almost impossible to abandon uneconomic routes or branchlines; therefore, carriers were required to cross-subsidize between profitable and unprofitable routes. Since deregulation, carriers can apply to the regulatory agency to abandon branchlines or exit from a route. In aviation this is straight-forward, in rail it tends to be somewhat more cumbersome. The regulatory agency either approves abandonment or gives direct subsidy to maintain uneconomic services. Usually abandonment or exit requires advance notice. Regulation of US railroads was initiated 1887 with the passage of the Interstate Commerce Act. The law was designed to curb the monopoly power that railroads enjoyed in many markets, with the objective of protecting shippers from paying monopoly rents. The law created a new federal regulatory agency, the Interstate Commerce Commission (ICC), which had jurisdiction over commerce taking place across state lines. Importantly, intrastate commerce issues were largely left to the states. The Interstate Commerce Act was motivated by political pressure from the railroads' customers (primarily Western farmers) to regulate alleged monopoly abuses and collusion among several of the country's large railroads. Railroads often faced limited and inferior competition along routes and had characteristically high fixed costs, which limited the possibility of multiple railroads competing for traffic along the same route . Due to limited competition and availability of substitutes, demand for the railroads' services was price inelastic and the railroads responded by using price discrimination at stations which only they served. The Act gave the ICC the power to set maximum rates for the railroads, while the subsequent Elkins Act required railroads to publish their rates, a provision designed to prevent them from price discriminating against similar groups of customers. Later amendments to the Act allowed for minimum, in addition to maximum, rate regulation. This provision reflected the suspicion of some ICC members that short-run marginal costs seemed too low relative to "full costs". The original Act had contained language that banned charging more for a shorter haul than a longer one. Later microeconomic research would demonstrate that the costing and rate-setting procedures of the ICC were fundamentally flawed. They reflected a misunderstanding of the relationship between costs and various types of outputs, a mistake that eventually led to uneconomic rate setting and imperiled the financial health of the industry until its deregulation in the late 1970s. The Act also contained provisions requiring the railroads to provide services to uneconomic points, a requirement that eventually led to the practice of cross-subsidization of services. Started regulation in 1930s. began to question the efficacy of competition as a regulator of business; a strong push for "codes of fair competition" in society as a whole; start to regulate trucking although it was a competitive industry. The Motor Carrier Act (MCA) of 1980 largely deregulated the interstate trucking industry in the US, reducing or eliminating most price and entry controls imposed by the federal government. Interestingly, while most federal regulatory efforts were abandoned relating to interstate trucking, states retained considerable regulatory power over the activities of intrastate truckers. Teske et al. argue that truckers turned their attention to the state level following the Motor Carrier Act, and were able to effectively capture state regulators and extract monopoly rents in what would otherwise be a competitive industry. They show that in the decade following the MCA, only eight of the 50 states had adopted legislation to loosen regulations that existed prior to 1980. Further, they argue that state-level trucking regulation is consistent with theories that emphasize regulation as serving to protect industry interests. Started regulation in late 1930s. to help create national network subsidization of the infant industry	protection from competitive entry to effect cross-subsidization (taxation by regulation - regulatory inspired cross-subsidization). Economic regulation of airlines in the United States began in earnest in the 1930s with the passage of the Civil Aeronautics Act (CAA) of 1938. The CAA was the result of lobbying by the airlines to protect themselves from what they considered to be "excessive" competition. The CAA created a new regulatory agency, the Civil Aeronautics Authority, which was subsequently split into two separate agencies, the Civil Aeronautics Administration and the Civil Aeronautics Board (CAB), in 1940 by President Roosevelt. The former had responsibility for air traffic control, safety programs, and airway development, while the latter was responsible for safety rulemaking, accident investigation and various types of economic regulation. The CAB carried out most of the regulatory activities of the CAA, which included regulating airline fares, as well as entry into and exit from airline markets. Entry into airline markets was limited by the CAB. It required carriers to obtain a "certificate of public convenience and necessity" (issued by the CAB) as a condition of entry in order to serve a particular route. Entry into major existing routes was difficult, as incumbent carriers often objected and appealed to the CAB. Thus, the CAB never admitted new entrants on routes that already had two or more carriers. Withdrawal of services (exit) from a route also required CAB approval. If a carrier went bankrupt, the CAB would typically arrange a merger which allowed the failing carrier to be acquired by a larger, healthier carrier (and giving the latter greater route authority in the process). Although the CAB did not set fares directly, it did have approval power over fares filed by carriers. Since fares were set in terms of industry-wide rather than route-specific costs, the result was often fares that were much higher than costs on many routes. Airlines were not permitted to engage in price competition on routes, leading them to instead engage in intense, quality of service-based competition. The primary means for this was increases in the frequency of flights, particularly on long-distance routes. While this type of competition may have improved service quality, it also led to lower average load factors as airlines operated planes at loads substantially below capacity. There are numerous effects of economic regulation. Entry regulation relieves competitive pressure. Entry regulation induces x-inefficiency in the industry - gold plating, feather-bedding, etc. It was found there was a 16% cost increase due to this and crown ownership of carriers Entry regulation transfers economic rents to organized input suppliers; e.g., labor unions, aircraft manufacturers, and thereby dissipates economic rents the industry hopes to gain. Services are unresponsive to customer needs, and there are allocative inefficiencies. Price regulations leads to excessive quality competition, see e.g., Douglas and Miller's work on airline quality competition. The system is much less flexible and far more inefficient. Exit regulation leads to cross-subsidization from profitable to unprofitable routes. Society as a whole loses as the total welfare under cross-subsidization is lower than with direct subsidy where funds come either from government general or through air transport tax. Rate-of-return regulations are sometimes used as a constraint to guide decisions by rate-makers concerning raising or lowering prices. That is the regulatory authority allows a fair rate of return on the value of the assets ("rate base") required to produce the services. This gives incentives for the firm to increase its "rate base" by investing more on capital input relative to labour input; In other words, the firm under rate-of-return constraint has relatively more capital vis-a-vis labor than is required to produce any given output. This is an important source of allocative inefficiency caused by the regulation. Over-capitalization, the (Averch–Johnson effect) is the tendency of companies to engage in excessive amounts of capital accumulation in order to expand the volume of their profits. If companies profits to capital ratio is regulated at a certain percentage then there is a strong incentive for companies to over-invest in order to increase profits overall. Regulatory administration is not itself free, and this high cost needs to be considered in any analysis of welfare gains and loses from regulation. Further, regulation reduces dynamism in the industry, there are fewer innovations, which are difficult to capture in static economic analyses, yet need to be considered. Making travel by one mode more expensive leads to a misallocation of traffic across modes, as other modes carry more traffic than a welfare analysis would suggest is optimal. These additional costs also may cause distortions elsewhere in the economy. Note that if market failure does not exist, there is no economic need for any economic regulation. Numerous studies have investigated the effect of regulation on the airlines, highway trucking, intercity bus, and taxicab industries. In all four cases there is an ample body of empirical evidence which suggests that in the absence of regulation the market mechanism would yield an output close to a competitive equilibrium. For these industries, economic regulation has become a prime cause of market failure, far from being a remedy for market failure. Therefore, the impact of regulation on price and quantities traded in these industries can be assessed by using a competitive solution as the appropriate benchmark. Early economic criticisms of regulation emerged in the 1940s and 1950s; and a growing number of academic researchers criticized regulation during the 1960s. These critiques plus empirical measures of the economic cost of regulation in 1970s led to political support, and ultimately, deregulation became the default policy. Deregulation of airlines began in 1978 and railroads and trucking in 1980. The 1970s and 1980s saw a wave of deregulation across many other sectors of the US economy, in addition to substantial regulatory reforms in the transportation . There are a couple of important points to note regarding the regulatory reforms of the 1970s and 1980s. First, most of the regulatory reforms that were undertaken addressed economic regulation, that is, regulation that directs or constrains the behavior of firms in terms of pricing, entry and exit decisions. They did not address other types of regulation such as safety, environmental, and antitrust regulation, which continued to be enforced in their previous forms and in many cases increased. Second, most of the regulatory reforms represented only partial deregulation of industries. For example, in the transportation sector prices, entry, and exit were mostly deregulated in the airline and interstate trucking industries by the early 1980s, while the ICC retained some control over railroad rate regulation. The Interstate Commerce Commission was later formally abolished in 1995, though some of its regulatory powers were transferred to a new agency, the Surface Transportation Board. no sunk costs -- a firm can enter and exit without entry and exit costs, including operating losses resulting from predation. price sustainability, there is a set of prices that can occur after the entry of at least one firm which will support profitable operation. The concept of contestable markets provided a broader condition supporting deregulation of transportation markets than the assumption of perfect competition. It was no longer implicitly assumed that markets in which there were not a large number of actual competitors could not function competitively in the absence regulation. Contestable market theory has several implications for regulation. For example, there is little need for regulation if sunk costs in an industry are low, thus regulation should be designed to focus on industries with substantial sunk costs. In that case regulation should regulate sunk facilities only and modify institutional arrangements for sunk assets. Regulators can rely on contestability theory only partially in deregulated airline markets mainly due to existence of entry barriers. Several studies looking at the airline industry have pointed out that the airline market is only partially contestable, and that the existence of actual competition is more effective than potential competition, as determined by the overall level of welfare provided by the market. Fares in markets with potential competition were also shown to be lower than in completely monopolized markets, but higher than in markets with actual competition. The implications of these findings are that regulators should concern themselves more with fostering competition in airline markets, for example by reducing barriers to entry, in order to achieve more of the benefits from competition. ↑ ""moral suasion"". A Dictionary of Business and Management. Encyclopedia.com. 2006. http://www.encyclopedia.com/doc/1O18-moralsuasion.html. Retrieved 2010-04-15. ↑ Romans, J.T. (December 1966). "Moral suasion as an instrument of economic policy". The American Economic Review 56 (5): 1220-1226. http://www.jstor.org/stable/1815305. Retrieved 2010-04-15. ↑ Posner, Richard A. (1974). "Theories of economic regulation". The Bell Journal of Economics and Management Science 5 (2): 335-358. http://www.jstor.org/stable/3003113. Retrieved 2010-04-16. ↑ Stigler, George J. (1971). "The theory of economic regulation". The Bell Journal of Economics and Management Science 2 (1): 3-21. http://www.jstor.org/stable/3003160. Retrieved 2010-04-16. ↑ Peltzman, Sam (August 1976). "Toward a more general theory of regulation". Journal of Law and Economics 19 (2): 211-240. ↑ Yandle, Bruce (May/June 1983). "Viewpoint: bootleggers and baptists -- the education of a regulatory economist" (pdf). Regulation 7 (3): 12-16. http://www.cato.org/pubs/regulation/regv7n3/v7n3-3.pdf. Retrieved 2010-04-19. ↑ Yandle, Bruce (1999). "Bootleggers and baptists in retrospect" (pdf). Regulation 22 (3). http://www.id.iit.edu/externalID/documents/bootleggers.pdf. Retrieved 2010-04-19. ↑ Evans, Andrew W. (1991). "Are urban bus services natural monopolies?". Transportation 18 (2): 131-150. http://www.springerlink.com/content/t61x51467t1468x5/. Retrieved 2010-05-03. ↑ Morrison, Steven A.; Clifford Winston (1996). "Causes and consequences of airline fare wars". Brookings Papers on Economic Activity, Microeconomics 1996: 85-123. http://www.jstor.org/stable/2534747. Retrieved 2010-05-03. ↑ Hilton, George W. (October 1966). "The consistency of the Interstate Commerce Act". Journal of Law and Economics 9: 87-113. http://www.jstor.org/stable/724995. Retrieved 2010-05-04. ↑ Braeutigam, Ronald R.; Gomez-Ibanez, Jose A. (ed. ); Tye, William B. (ed. ); Winston, Clifford (ed.) (1999). "Chapter 3: Learning about transport costs". Essays in Transportation Economics and Policy: A Handbook in Honor of John R. Meyer. Brookings Institution Press. pp. 57-97. ↑ Teske, Paul; Best, Samuel; Mintrom, Michael (1994). "The economic theory of regulation and trucking deregulation: shifting to the state level". Public Choice 79: 247-256. http://www.springerlink.com/content/x464225r13663224/. Retrieved 2010-05-03. ↑ Morrison, Steven A.; Winston, Clifford (1989). "Airline deregulation and public policy". Science 245 (4919): 707-711. doi:10.1126/science.245.4919.707. http://www.sciencemag.org/cgi/content/abstract/245/4919/707. Retrieved 2010-05-10. ↑ Gillen, David W.; Tae H. Oum, Michael W. Tretheway (January 1990). "Airline cost structure and policy implications: a multi-product approach for Canadian airlines". Journal of Transport Economics and Policy 24 (1): 9-34. http://www.jstor.org/stable/20052902. Retrieved 2010-04-19. ↑ Miller, George W.; James C. Miller III (1974). Economic Regulation of Domestic Air Transport: Theory and Policy. Brookings Institution. ↑ Winston, Clifford (September 1993). "Economic deregulation: days of reckoning for microeconomists". Journal of Economic Literature 31 (3): 1263-1289. http://www.jstor.org/stable/2728241. Retrieved 2010-05-04. ↑ Baumol, William J.; John C. Panzar, Robert D. Willig (1982). Contestable Markets and the Theory of Industry Structure. Harcourt Brace Jovanovich. ↑ Demsetz, Harold (April 1968). "Why regulate utilities?". Journal of Law and Economics 11 (1): 55-65. http://heinonline.org/HOL/Page?handle=hein.journals/jlecono11&div=9&g_sent=1#61. Retrieved 2010-04-16. ↑ Levine, Michael E.. "Airline competition in deregulated markets: theory, firm strategy, and public policy" (pdf). Yale Journal on Regulation 4: 393-494. http://www.theairlinezone.com/wp-content/uploads/2009/09/AIRLINE-COMPETITION-IN-DEREGULATED-MARKETS.pdf. Retrieved 2010-04-16. ↑ Bailey, Elizabeth E. (1981). "The contestability of airline markets during the transition to deregulation". Law and Contemporary Problems 44 (1): 125-145. http://www.jstor.org/stable/1191388. Retrieved 2010-04-19. ↑ Morrison, Steven A.; Clifford Winston (April 1987). "Empirical implications and tests of the contestability hypothesis". Journal of Law and Economics 30 (1): 53-66. http://www.jstor.org/stable/725391. Retrieved 2010-05-03. This page was last edited on 19 April 2016, at 10:26.